How to separate the “signal conductor” effects from the “ground conductor“? Do we need more pins in the schematic symbol for the EM data? In my EM trainings, I notice that ground nodes in transmission line EM models can cause confusion. Most often, that confusion comes up with RFIC designers, who are used to rather non-ideal ground path behaviour. They often wish to separate the effects in the “signal conductor” of a line from the effects in the “ground conductor”. But the point is … depending on the port setup, it might be impossible to differentiate between them. In this document, I will discuss voltage and current at the ports, instead of S-parameters. That’s just another way to view the results, and I hope that the use of voltage and current will be more intuitive to understand some concepts. The lessons learned from this apply to S, Y, Z parameters in the same way. 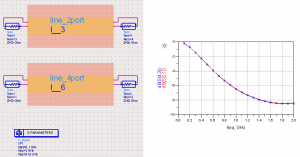 RF simulation tools use ports to define the source and load. While pins and ports might look similar in the layout tool, there is an important difference: a port always consists of two pins: signal and reference (“return”). The current in these two pins is the same, with opposite direction: I(signal) = – I(return). The port voltage is measured between signal and reference. In most cases, that reference is different for each port, because the ground locations are different. 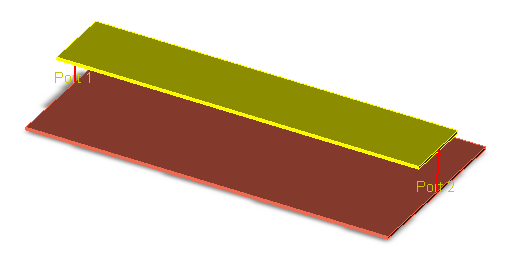 In the line shown above, there is “ground” at both ends of the lines, but these two grounds are at different locations and there is some path length between them. The left “ground” is different from the right “ground”. Different locations, different potential. So instead of calling all this “ground”, we might better say “reference node of port 1” and “reference node of port 2”. From this example, we can learn something important about what is included in the S-parameters (and what is not included). To measure the S/Y/Z-parameters of the line, at each end, we measure the port voltage between signal and ground pin, and the port current (remember? same magnitude in signal and return conductor, oppositive sign). For each port, we have one voltage and one current value. This is the Z-matrix, which can be easily converted to the S-matrix. We will keep discussing voltages and currents, for an intuitive understanding. We can now calculate the voltages and currents for this line. All voltages and currents? Really? V1 is the voltage (difference) between the signal pin and reference pin at port1, and V2 is the voltage (difference) between signal pin and reference pin at port 2. Only these voltages are know, with respect to these reference locations. If we want to calculate the voltage drop on the ground conductor, between port1 reference pin and port 2 reference pin, we can’t do that. There is no such information available in our 2-port data. Take a second to realize that, it’s important. 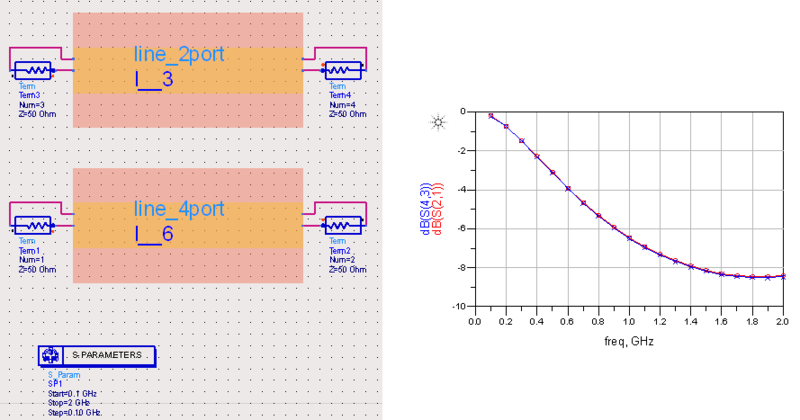 For the 2-port simulation, we can’t separate the “signal conductor” effects from the “ground conductor” effects. If there is a gap in the line, we don’t know if the signal conductor is broken or if it is the ground conductor. Results for the 2-port simulation have all that data combined in “the line”, without separating signal and ground conductor effects. Whenever I discuss this, some circuit designers point me to the schematic symbol of the 2-port data, which might have 4 separate pins: 2 signal pins and 2 reference pins. Couldn’t we re-wire this on the schematic to measure the ground path separately, even for a 2-port simulation? The answer is no. We could re-wire the schematic, but the separate ground pins promise too much and we don’t get meaningful results. The data just isn’t there, no matter what we wire at schematic level. This will be shown below using an example. In our example, we use a signal line over ground. The ground is explicitely drawn on the cond2 layer, and ground pins are placed on that layer. In total, we have 4 pins: pin 1 and 2 at the signal conductor, and pin3 and pin4 at the ground conductor. For easier visibility, the ground conductor pins are slightly offset in this example. The other possibility is to leave these 4 pins ungrouped, resulting in 4 ports instead of only 2 ports. Now with these 4 ports, we can measured the voltages and currents at all 4 pins separately. This allows to drive the regular line mode, but it also allows to test the signal conductor and return conductor separately. By having 4 ports instead of 2 ports, we have that extra information. The testbench is simple. First, we place both EM blocks in the schematic, and drive the normal line mode. The symbols both look the same, with separate pins for the grounds. As expected, we get identical results for the normal line operation, with ADS ports connected properly between the symbols (+) and (-) terminals. Next, we try to take advantage of the (seemingly) extra information available through the separate ground pins. We connect ports between the ground pins, and try to measure the resistance in the ground conductor. The data table shows the extracted resistance for both 2-port and 4-port data. We get a disillusioning 1 TeraOhm for the 2-port case, which means that this path is open/undefined. The symbol pretends to allow a connection, but this is misleading. For the 2-port simulation, the extra ground pins don’t provide additional value, because they don’t come with additional data to support such configurations. We can’t cheat by adding pins, if there is no data available. For the 4-port simulation, we do get meaningful data. Here, the 4-port data allows to measure any path between any combination of ports, and separate signal- and return path. So what can we take away from this example? It should be obvious now that separate ground pins in the schematic symbol only add value if they come with additional data to support the extra connections. Using 2-port data with 4 pin symbols (2 for signal, 2 for reference) can be misleading, and will only provide correct results when connected in the same way as EM-simulated. All other connections will not provide meaningful results. Note that this is not the universal solution for everything – some restrictions apply to “ground at infinity”, please refer to the Agilent documentation. To obtain results where you can separate signal and return path effects, you must simulate a line with 4-ports, where all 4 pins are measured with reference to some other potential (ground plane, or ground at infinity). Only that 4-port simulation provides enough data.